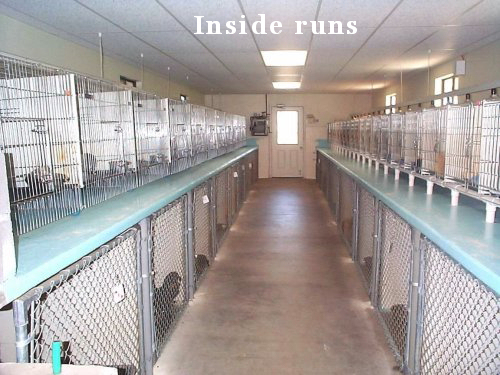 This is the Inside Runs of our Kennel. It has two levels that is very easily kept up by spraying down both top and bottom floors with a water hose. The cages on the top right is where the mother Poodles and Yorkies are kept during time just before and after delivery of new born Puppies. Each cage has a light above it to keep the newborn Teacup Yorkie Puppies, Teacup Poodle Puppies warm when it is cool. The mother Tiny Teacup Poodle and Tiny Teacup Yorkie are let out twice daily into the runs on the floor to exercise and do there business. Yorkie and Poodle Puppies are kept in the cages until they are old enough to go or be put in a floor run. The cages on the left are bigger cages that we put our bigger Toy Poodles and Yorkies into. The second floor is made of concrete and has floor drains so the Tiny Poodles and Tiny Yorkies on the bottom do not get wet when the top is sprayed off. Each of the runs has automatic water bowls that fill up as the Poodle and Yorkie drink. This setup works really well for both the Teacup Poodles and Teacup Yorkies and us. It also has central heat and air for the comfort of the Tiny Teacup Poodles and Tiny Teacup Yorkies. When the weather is mild we use a attic fan to ventilate the Kennel.